With such a vast amount of accommodation to choose from today a number of property owners have opted to promote and rent out more eccentric and unique accommodation in the hope of catching the attention of holidaymakers. This accommodation can vary from strangely suspended properties to converted boats and lighthouses. Each one of the properties feels truly unique and full of character, and a memorable holiday stay is sure to follow anyone who chooses to stay in such a place. For families with kids in particular these properties can be extra special, the unusual appearance and feel of a quirky cottage allows children to lose themselves in their imaginations. Despite the strange layout and appearance of these rentals, a high quality and standard is maintained and these holiday homes are often found in beautiful parts of the British countryside and coastline. Increasingly holidaymakers are seeking out the unusual and unique when choosing self-catering accommodation, and because of this we have decided to take a look at some of the most unusual and most strange properties that Country Cottages Online has to offer. Enjoy! Quirky on the outside, stylish on the inside. 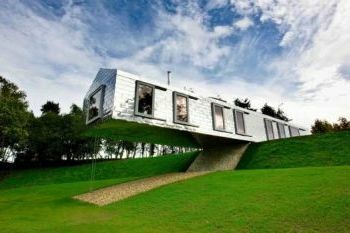 At a glance, a large this unusual self-catering property appears almost to be suspended in mid-air over the edge of a small hill. However, despite this striking appearance, the balancing barn is in fact extremely stable (being held in place with the help of a supporting beam). The inside of the property itself is very glamorous and has been tastefully decorated. Aside from its floating appearance, the balancing barn also features an outside glass floor and is set near the Suffolk Coast and Healths AONB. Ever fancied sleeping inside a railway carriage? Probably not! But that isn’t too say you should be put off by this lovely holiday home. The railway carriage is a very well kept rental with a lot of charm. This pet-friendly holiday home was purpose built to give holidaymakers a holiday experience like no other. 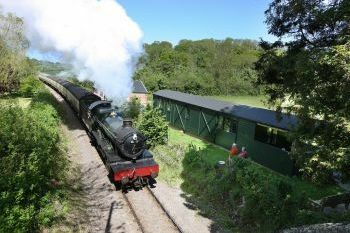 Situated right next to the railway tracks of the excellent West Somerset Stream Railway (Which still runs a semi-regular service for tourists), the railway carriage has a modern interior and is just 10 miles from the popular seaside town of Taunton. 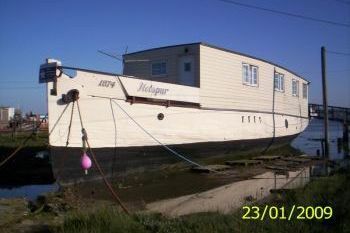 This historic moored houseboat has been painstakingly converted into a high-quality holiday home for you to enjoy. This impressive property has room for up to 9 guests and guests are treated to stunning maritime views. Enjoy magical sunsets from the comfort of this quirky holiday home. The property is situated in a busy seafront area so it offers a unique holiday experience and atmosphere. Camping with a twist. 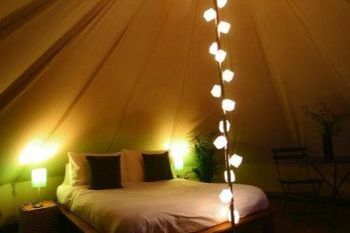 Glamping is one particular form of holidaying that has picked up a lot of momentum in recent years. This unique form of holidaying is ideal for a romantic getaway and allows you and your partner to be more connected to the great outdoors without the need to rough it in a sleeping back or sacrifice much of the quality and comfort you would expect with a normal self-catering property. Glamping facilities, like the luxury bell tent, are full of style, boast a great range of facilities and offer all the comforts necessary to enjoy a tranquil holiday in a secluded rural location. This particular property is in a wonderful countryside location which is also within easy reach of areas such as Plymouth, Exmoor and Paignton.